These special zonal pelargoniums are often mistakenly called geraniums. The Stellars have star shaped flowers that give the cultivars their name. The petals are not as full as other zonals but the leaf markings are quite striking. There is a lot of bud at the moment and they are massing in the garden quite well. 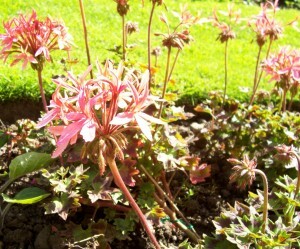 As with other geraniums they like a free draining soil but are not troubled with pests (famous last words). The zonal leaf marking became more apparent when the plants were put outside from the greenhouse. Plants are easy to propagate from now all through summer and autumn. Just keep the plants on the dry side and frost free in winter. Plants last several years but are more robust and floriferous from new stock. Seed can be sown in warmth from February or raised from plug plants. 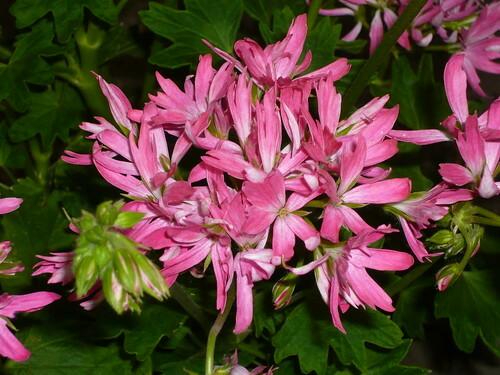 Thompson & Morgan supply Pelargonium seeds and plants in season.